Check out this JUST RELEASED Titans trailer! Ohhh, did you see that? Beast Boy was a Tiger! I don’t know why but I was really worried they wouldn’t have him morphing into animals for some reason, but he looked good! This felt way more like a teaser than a trailer, but I’ll take it! I am eagerly awaiting for this series to drop so I can binge watch the whole damn thing! With the release of this comes a whirlwind of press photos and promo images, and instead of cherry picking which ones I want to share, I’ll just throw them all into a gallery for you! If you are curious, here is the official press release for this trailer drop from DC Universe. and original animated movies Reign of The Supermen, Justice League vs. The Fatal Five, and Batman: Hush, to join DC UNIVERSE line-up!! BURBANK, Calif. – October 4, 2018 – At the world premiere of Titans, held in conjunction with New York Comic-Con, DC UNIVERSE unveiled a new trailer for the much anticipated live-action original produced by Warner Bros. Television. Titans follows a team of young heroes as they come of age and find belonging in a gritty take on the classic Teen Titans franchise. Ahead of the season one debut of Titans on October 12, the live-action show has been picked up for a second season exclusively on the all new DC UNIVERSE digital subscription service. DC UNIVERSE also revealed a sneak peek of the upcoming animated series Harley Quinn (2019) featuring Kaley Cuoco (Big Bang Theory) who will voice the lead role. The adult animated comedy series follows Harley’s adventures, where alongside ragtag crew of DC castoffs, she tries to earn a seat at the biggest table in villainy: the Legion of the Doom. The strong voice cast for Harley Quinn also includes comedic talents such as Lake Bell (In a World…, Wet Hot American Summer series, Childrens Hospital), Alan Tudyk (Rogue One: A Star Wars Story), Ron Funches (Powerless), JB Smoove (Curb Your Enthusiasm), Jason Alexander (Seinfeld), Wanda Sykes (Black-ish), Giancarlo Esposito (Breaking Bad), Natalie Morales (Bojack Horseman), Jim Rash (Mike Tyson Mysteries), Diedrich Bader (Veep), Tony Hale (Arrested Development, Veep), Chris Meloni (Happy!, Law & Order: Special Victims Unit). 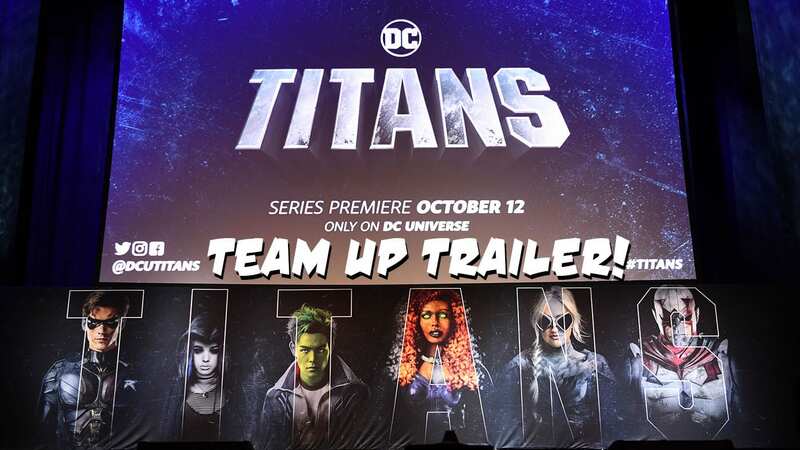 Fans can see the cast of Titans team up in a new trailer revealed for the first season debuting October 12 as well as catch a sneak peek for the upcoming adult animated comedy series Harley Quinn. 1984 classic film Supergirl starring Helen Slater will be released on October 5 and be available through the end of 2018. After losing a powerful orb, Kara, Superman’s cousin, comes to Earth to retrieve it and instead finds herself up against a wicked witch. In 2019 DC Universe original animated movies Reign of The Supermen, Justice League vs. The Fatal Five, and Batman: Hush will join the DC UNIVERSE service. David Goyer’s live-action series Krypton will also premiere on DC UNIVERSE in 2019. Season 1 previously aired on the SYFY network and will now become available to DC UNIVERSE members. Set two generations before the destruction of the legendary Man of Steel’s home planet, Krypton follows Superman’s grandfather — whose House of El was ostracized and shamed — as he fights to redeem his family’s honor and save his beloved world from chaos. Created exclusively for DC UNIVERSE, a new prequel comic book for Young Justice: Outsiders will accompany the exclusive original animated series in 2019 and will be created by producer Greg Weisman and artist Christopher Jones. Additionally, new comics being released in October on DC UNIVERSE include New Teen Titans (#13 – #20) from 10/2 – 10/15 and New Teen Titans (#21 – #41) from 10/16 – 10/29, Batman: The Long Halloween from 10/23 – 11/5, and Batman: Dark Victory from 10/30 – 11/12. Titans cast signing event: Following on the Titans Premiere, New York Comic Con fans will be able to attend a signing event in the DC booth #SC01. Series stars Brenton Thwaites (Pirates of the Caribbean: Dead Men Tell No Tales), Teagan Croft (The Osiris Child), Anna Diop (24: Legacy), Ryan Potter (Big Hero 6: The Series), Minka Kelly (Friday Night Lights) and Alan Ritchson (Blood Drive) will be on hand to meet and greet fans at 1:15pm – 2:00pm on Friday, October 5. DC DAILY: The ultimate news show for DC fans airing daily on DC UNIVERSE, will be filming episodes live from New York Comic Con bringing the latest news, events and talent directly to members. DC Daily is the place to see new promotional content, highlights of new features and giveaways. Exclusive rewards: Any DC UNIVERSE members who visit the DC UNIVERSE section of DC booth SC01 will receive an exclusive Titans gift bag and exclusive Robin pin. Launched on Batman Day, DC UNIVERSE is a first-of-its-kind digital subscription service that gives fans access to exclusive content and experiences not available anywhere else. At $7.99 per month or $74.99 annually (plus taxes, where applicable), membership includes all-new original live-action and animated series, classic TV series and films, epic original animated movies, a curated selection of digital comic books, breaking news, an expansive DC-centric encyclopedia, access to exclusive merchandise, and much more. DC UNIVERSE is available in the U.S. on iOS, Android, Apple TV, Android TV and the Roku platform, as well as the web and mobile web. DC UNIVERSE is a standalone digital experience designed for the DC fan. Showcasing DC’s iconic characters, DC UNIVERSE offers new original live-action and animated series, legendary films and series, and epic animated movies, as well as a fan community, a curated selection of comic books, and exclusive merchandise. DC UNIVERSE is operated by Warner Bros. Digital Networks in collaboration with DC and Warner Bros. Digital Labs. DC UNIVERSE offers access to exclusive content and experiences not available anywhere else. To learn more, visit www.dcuniverse.com.